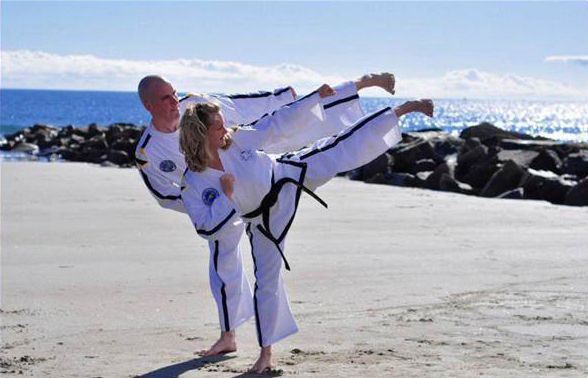 TaeKwon Do is a form of unarmed training for the purpose of self-defense. It is a combination of both physical and mental training. Physically the art strengthens your body, building stamina, increases flexibility, improves cardiovascular health, and improves your balance. Mentally, the art emphasizes the concepts of self-control, perserverance, integrity, and courtesy inside and outside the classroom. Mr. and Mrs. B blend the two pieces of the art in a positive family atmosphere, teaching their students how to protect themselves while building their self-confidence. My kids first day and we love it! The atmosphere is so friendly yet very disciplined. It is amazing to see how they give personal attention to each and every kid I am very happy to choose this place and hope to see my kids grow strong and confident. Highly recommend! The instructors are the best. They are always the great examples for junior students and they show what means to be caring and respectful. They are also fun! Mr. B TKD has such a great sense of family! My children have been learning in this TKD journey that any achievement in life really takes consistent effort. TKD training teaches the importance of being diligent. They know TKD Black belt journey is only possible with the aggregate of countless individual effort. My children go to Mr. B TKD because they learn so much more than the art of TKD. Mr. B TKD students are learning the fundamental importance of being respectful, courteous and so much more at every training. First of all, my children love it because it’s fun! They are challenged to work harder but at the same time instructors are always celebrating students hard work and they don’t forget to have fun in each class! All students (regardless of junior or adults or color belt or black belt) can come to the class and able to train themselves meaningfully towards their individual goal. I started TKD to spend time with my grandchildren. At Mr. B’s families are encouraged to learn and train together. The instructors are so knowledgeable and patient. They stress the whole experience not just the physical. My grandchildren have gained so much in confidence and ability. It has been great for me as well. Learning new material and skills keeps the mind and body sharp which is so important as we age. We have also made some wonderful friends. So glad we chose to do this together. My daughter has been training under Master Boisvert since 2011, and it has been an overwhelmingly positive influence on her. In her time training with Master Boisvert, she has learned the importance of courtesy, integrity, self-control, perseverance, and indomitable spirit – the tenets of taekwondo. Master Boisvert’s instruction goes beyond technique mastery, blending study of the history of the art with applying these tenets to every day life. Each student is asked to learn and reflect on the core principles of the art. Additionally, Master Boisvert and his family (who all study there!) truly do invite you into their larger taekwondo family as you take your journey. I can say without question that my daughter’s time with Master Boisvert has given both her and me confidence in her ability to tackle any challenge she will face in life. Celebrating 20 years as the Seacoast's premier martial arts school. © 2019 All Rights Reserved Mr. B's TaeKwon Do | Created and Hosted by SmartNet Technologies, Inc.